"The Palestinian MYTH" is one of the most misunderstood issues today is the question of "Who are the Palestinians and where did they come from?" There is a propaganda war going on now with regard to the term "Palestine." At one time it might have been argued that Palestine was a harmless designation of the Middle Eastern area that is generally thought of as the Holy Land. During the last few decades, however, the term "Palestine" has been adopted by Arabs living in Israel in the area west of the Jordan River…. It is specifically employed to avoid the use of the name ISRAEL, (just as Rome did in the first century A.D.) and must be considered an anti-Israel and anti-God term! Sadly, in all Arab maps published in; Jordan, Egypt and other Arab and Muslim nations, the area west of the Jordan River is called "Palestine," without any reference to Israel… Palestine is the term now used by those who want to deny the legitimate existence of Israel as a genuine nation among the family of nations. The term has even been adopted by the former terrorist-turned political entity (PLO) within Israel that is gradually obtaining more and more pockets of territory through the "peace processes," and formally known as the P.A. (Palestinian Authority). "Palestine" has successfully become a political propaganda term with massive anti-Israel implications and dangerous for Jewish people. Today the world press uses the term consistently as a means to question the legitimacy of the modern state of Israel. Christians also have used the term Palestine for centuries, and have become seduced into using the term in a manner which gives credence to those who wish to destroy God’s Chosen People. In earlier times this might have been excused because of its common usage… but since the rebirth of Israel in 1948 and in light of the perpetual hatred of Islam seeking Israel’s destruction, with the empowering aid of Western political power brokers… and it is important that every Christian should recognize that God is moving to bring history to its climax around Jerusalem! Therefore, in light of the current propaganda war against Israel, Christians must now re-evaluate the term "Palestine" and consider whether it is biblically, theologically and prophetically accurate to participate in the political partitioning of God’s Land. We do not hate the "Palestinians" we just want to be RIGHT with God. 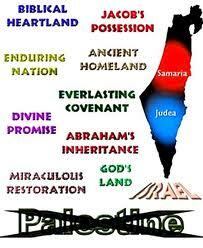 God set the Land and its boundaries for Israel and therefore it is NOT UP FOR SALE…! What are the precise borders of the land promised to Abram’s descendants? The Lord makes them perfectly clear. Like any modern-day land purchase, the deed indicates the boundaries of the land given: from the Nile River (which is mainly modern Egypt and Sudan) to the Euphrates (modern-day Iraq). To ensure that there is no doubt about the land’s boundaries; Scripture also indicates the different groups of people that occupy it: "...the land of the Kenites, Kenizzites, Kadmonites, Hittites, Perizzites, Rephaites, Amorites, Canaanites, Girgashites and Jebusites." Genesis 15: 18 - 21 We know that these peoples lived in what is today Egypt, Sudan, Lebanon, Jordan, Syria, Iraq, part of Asian Turkey, and of course all of Israel, including Gaza and the West Bank. There are several key elements in this verse that must be considered… First, it is a covenant between God and Abram, and as such it cannot be changed by human effort. God indicated the terms of this covenant: The land that is promised was not given to Abram, but rather to his descendants. Although some may argue that this includes all of Abram's descendants, we know that the pact was passed on only to Isaac, then to Jacob (Israel) and his children. YES…! Abram did have other children, and the Ishmaelites are also descendants of Abram, but the Bible affirms that the covenant is passed through the son of promise – Isaac. The next key element of the promise is that the land given by God was going to be acquired at a future time. "To your descendants" has no time limit! Just because it has not yet been fulfilled does not mean that it will not be fulfilled in coming years. Quite the contrary, we see that Israel's history perfectly follows God's plan as indicated in Deuteronomy 30:2 - 4, including the dispersion due to disobedience and re-gathering into the land because of the unchanging nature of the covenant. When and why did Rome move to eradicate Israel’s Land Heritage? At the time of Christ the Jewish state was ruled by puppet kings of the Romans; the Herod’s. When the Jews revolted in 66 AD, the Romans destroyed the Temple in Jerusalem (70 AD). The Bar Kocha revolt between 132 and 135 AD was also suppressed; Jericho and Bethlehem were destroyed, and the Jews were barred from Jerusalem. A Land called "Palestine"… In the 2nd century A.D. the last attempt of the Jews to achieve independence from the Roman Empire ended with the well-known event of Masada (near Dead Sea) that is historically documented and universally recognized as the fact that determined the Jewish Diaspora in a definitive way. The Land where these things happened was until then the province known as Judea, and there is no mention of any place called "Palestine" before that time. The Romans killed many Jews and sold many more into slavery. Some of those who survived left the devastated country (establishing Jewish communities throughout the Middle East)… but there was never a complete abandonment of the Land of Israel. There is and there were always Jews and Jewish communities in Palestine, though the size and conditions of those communities fluctuated greatly. Ancient Romans, as well as modern Palestinians, have fulfilled the Hebrew Scriptures Prophecy that declares… "They lay crafty plans against Your People... they say: ‘come, let us wipe them out as a nation; let the name of Israel be remembered no more. '"(Psalm 83:3 - 4). They failed, as Israel is still alive! Any honest person would recognize that there is no mention of the name Palestina in history before the Romans renamed the province of Judea and that such a name does not occur in any ancient document… is not written in the Bible… neither in the Hebrew Scriptures… nor in the New Testament… and not even in the Assyrian, Persian, Macedonian, Ptolemaic, Seleucian or other Greek sources… and that not any "Palestinian" people has ever been mentioned… not even by the Romans that invented the term. If "Palestinians" allegedly are the historic inhabitants of the Holy Land, why did they not fight for independence from Roman occupation as Jews did? How is it possible that not a single Palestinian leader who led a revolt against the Roman invaders is even mentioned in any historic record? Why is there is not any Palestinian rebel group mentioned, as for example the Jewish Zealots? Why does every historic document mention only the Jews as the native inhabitants, and that the Greeks, Romans and others as foreigners dwelling in Judea… but not any Palestinian people; neither as native nor as foreigner? What is more, there is no reference to any Palestinian people in their own Koran, although Muslims claim that their prophet was once in Jerusalem (an event that is not mentioned in the Koran either). It appears evidently that he did not meet any Palestinians in his whole life, nor so did his successors. Caliph Salahuddin al-Ayyub (Saladin) knew the Jews and invited them, to settle in Jerusalem, and that he recognized it as their Homeland… but he did not know any Palestinian...! To claim that Palestinians are the original people of the land of Israel is not only against secular history but also against Islamic history! The name "Falastin" that Arabs today use for "Palestine" is not an Arabic name, but adopted and adapted from the Latin Palaestina. How can an Arab people have a western name instead of one in their own language? Because, the use of the term "Palestinian" for an Arab group is only a modern political creation without any historic or ethnic grounds, and did not indicate any people before 1967… An Arab writer and journalist declared: "There has never been a land known as Palestine governed by Palestinians. Palestinians are Arabs, indistinguishable (like two peas in a pod) from Jordanians (another recent invention), Syrians, Iraqis, etc. Keep in mind that the Arabs control 99.9 percent of the Middle East lands. Israel represents one-tenth of one percent of the landmass. But that's too much for the Arabs. They want it all. And that is ultimately what the fighting in Israel is about today... No matter how many land concessions the Israelis make, it will never be enough." - Joseph Farah, "Myths of the Middle East"
Just a century ago, the modern State of Israel did not exist… and half of the world’s Jewish population was wiped out by the Nazi Holocaust machine. But today Israel stands strong among the nations. The prophet asks in Isaiah 66:8, "Who has ever heard of such a thing? Who has ever seen such things? Can a country be born in a day, or a nation be brought forth in a moment?" The answer is YES! Not because of Israel's might, but because of God faithfulness to His covenant. The Land was taken away from the Jewish people to appease the Arabs... the map below doesn't lie! The prevalent perception is that Jewish immigrants arrived in "Palestine" amidst a crowded population in 1917, at the time the Balfour Declaration established a "Jewish National Home." Few Middle East observers have been aware of the extent of which the Jewish Settlement has begun to develop in the 19th Century. The Jews, many believe, infringed upon the "natives (Arabs)" on "millennia" – settled "Palestinian Arab Land." Contrary on that assumption, of the sparse Muslim population found in "Palestine" at that time, many were transient and most were landless. Israel is considered equivalent to all Palestine… BUT the Land on which Israel was located contained only a fraction of the "Palestine Mandate." It was originally dedicated to the Jews, as their homeland, by the British Mandate, the Balfour Declaration. The League of Nations, and the British had designated the land called "Palestine" for the Jewish National Home" – east and west of the Jordan River from Mediterranean to Arabia and Iraq, and north and south from Egypt to Lebanon and Syria. The Arabs of that time achieved independent Arab statehood in various lands around Palestine BUT not within Palestine itself. Sovereignty was granted after WW1 to Syria and Iraq; in addition Saudi Arabia consisted of approx. 865,000 sq miles that was designated as "purely Arab." Considering all the "territories" that had been given to Arabs, Lord Balfour "hoped" that the "small notch" of Palestine which was given to the Jewish people would not be "grudged" to them by Arab leaders. But, in a strategic move the British apparently felt the need to appease the Arabs, and they quietly gouged out roughly three quarters of the Palestinian territory mandated for the Jewish homeland… into an "Arab Emirate Transjordan and called it "Eastern Palestine." This fact adds another dimension to the promise in Genesis 15: the Lord is giving to Abram's descendant’s land that is currently occupied by other nations! The question arises of how Israel will acquire this land – will she have to invade and conquer other countries? The Scripture offers no indication that Israel will have to fight and conquer; therefore, the logical answer is that the Lord will see that the promise is fulfilled. If God has fulfilled every promise given thus far, we can be certain that He will fulfill those that remain – including all the land promised to Abram's descendants. He reaffirmed His promises of His boundaries of the Land of Israel in other Scriptures: Numbers 34:1 – 13: Deuteronomy 11: 24 and Ezekiel 47:15 – 20. We have established that there was no such ancient land as "Palestine"… so, now let’s try and establish the identity and origin of the so-called Palestinian people…? Palestinians are the newest of all the peoples on the face of the Earth. Though there were Arab communities scattered in the territories of biblical Israel during the last hundreds of years, there was never a nation called "Palestine" ruled by local peoples… so who are the real Palestinians? History tells us that all the inhabitants of the land came to be known as Palestinians since this was the name of the territory and even the Jews were called Palestinians until 1948. The myth of a national Arab Palestine that goes back generations is a... fantasy and a myth as well as an outright lie. Wallid Shoebat, who was a former PLO terrorist, acknowledged the lie he was fighting for, and the truth he was fighting against; "Why is it that on June 4th, 1967 I was a Jordanian and overnight I became a Palestinian? We did not particularly mind Jordanian rule. The teaching of the destruction of Israel was a definite part of the curriculum… but we considered ourselves Jordanian until the Jews returned to Jerusalem. Then all of the sudden we were Palestinians! They removed the star from the Jordanian flag and all at once we had a Palestinian flag." Wallid also said; "When I finally realized the lies and myths I was taught, it is my duty as a righteous person to speak out. As I lived in Palestine, everyone I knew could trace their heritage back to the original country their great grandparents came from. Everyone knew that their origin was not from the Canaanites, but ironically, this is the kind of stuff our education in the Middle East included. The fact is that today's Palestinians are immigrants from the surrounding nations! I grew up well knowing the history and origins of today's Palestinians as being from Yemen, Saudi Arabia, Morocco, Christians from Greece, Muslim Sherkas from Russia, Muslims from Bosnia, and the Jordanians next door." This declaration by Wallid Shoebat who became a "Palestinian," should have some significance for a sincerely neutral observer… there is no such a thing as a Palestinian people, or a Palestinian culture, or a Palestinian language, or a Palestinian history. There has never been any Palestinian state… neither any Palestinian archaeological find nor coinage. The present-day "Palestinians" are an Arab people, with Arab culture, Arabic language and Arab history. They have their own Arab states from where they came into the Land of Israel less than a century ago to contrast the Jewish immigration. That is the historical truth. They were Jordanians (another recent British invention, as there has never been any people known as "Jordanians") and after the Six-Day War in which Israel utterly defeated the coalition of nine Arab states and took legitimate possession of Judea and Samaria. The Arab dwellers in those regions underwent a kind of anthropological miracle and discovered that they were Palestinians - something they did not know the day before. Of course, these people having a new identity had to build themselves a history, namely, had to steal some one else’s history… and the only way that the victims of the theft would not complain is if those victims did no longer exist! Today the Palestinian leaders claim; two contradictory lineages from ancient peoples that inhabited in the Land of Israel: the Canaanites and the Philistines. Let us consider both of them. Who were the Canaanites…? The Canaanites are historically acknowledged as the first inhabitants of the Land of Israel, before the Hebrews settled there. Indeed, the correct geographic name of the Land of Israel is Canaan, not "Palestine" (a Roman invention, as we have already established). They were composed by different tribes that may be distinguished in two main groups: the Northern or Coastland Canaanites and the Southern or Mountain Canaanites. They are better known in history by their Greek name "Phoenicians." They did not found any unified kingdom but were organized in self-ruled cities, and were not a warlike people but rather skilful traders, seafarers and builders. Their language was adopted from their Semitic neighbours, the Arameans, and was closely related to Hebrew (not to Arabic!). Phoenicians and Israelites did not need interpreters to understand each other. Four hundred years before Israel the Bible first mentions the Canaanites in Genesis 12:6. Their behaviour and religion were both wicked. Genesis 18:16 - 20, tells the story of wicked and evil, Sodom and Gomorrah (destroyed by God); two cities in Canaan. The Canaanite religion involved child sacrifice. It was a practice that increased the more their cities expanded. The Canaanite culture was evil and God wanted it removed! Gradually driving the Canaanites out of their land and into neighbouring nations where they would be the minority (Exodus 23:27 - 30). God issued two specific commands concerning the Canaanites east of the Jordan River (Deuteronomy 2:26-36, 3:1 - 11) and six commands concerning Canaanites in general (Exodus 23:31 - 33, 34:11 - 16, Numbers 33:50 - 56, Deuteronomy 7:1 - 5, 12:2 - 3, 20:10 - 18). The two specific commands… were for the conquest of the kingdoms east of the Jordan. Of the six general commands, only Deuteronomy 7:1 - 5 demands the total destruction of the Canaanites. Deuteronomy 20:10 - 18 qualifies this by specifically mentioning the destruction of Canaanite cities. The other four concern driving them out, destroying their idols… and not making any treaties with them! When the first Hebrews arrived in the land of Canaan they shared the land but did not intermarry, as it was forbidden for Abraham's family to marry the Canaanites. Nevertheless, some of the twelve sons of Jacob married Canaanite women. The Tribes of Israel began to mix with the local inhabitants. After the Exodus, when the Israelites conquered the Land, there were some wars between them and the Canaanites throughout the period of the Book of Judges and were definitively subdued at the time of King David… by that time, Canaanites were married to Israelites. Actually, the Canaanites are seldom mentioned during the Books of Kings' period, usually in reference to their heathen customs introduced among the Israelites… but no longer as a distinguishable people. The only people that can trace back a lineage to the ancient Canaanites are the Jews, not the Palestinians, as Canaanites did not exist any longer after the 8th century B.C…. therefore, the Palestinians cannot claim any descent from the ancient Canaanites. Who were the Philistines…? The ancient Philistines and modern Palestinians have something in common… both are invaders from other lands! That is precisely the meaning of their name and not an ethnic denomination but an adjective applied to them; "Peleshet," from the verb "pelesh," "dividers," "penetrators" or "invaders." The Philistines were a confederation of non-Semitic peoples coming from Crete, the Aegean Islands and Asia Minor, also known as "Sea Peoples". The original homeland of the group that ruled the Philistine federation, namely the "Pelesati," was the island of Crete. When the Minoic civilization collapsed, also the Minoic culture disappeared from Crete, as invaders from Greece took control of the island. These ancient Cretans arrived in Southern Canaan and were known as "Pelestim and Keretim" by Hebrews and Canaanites. Their first settlement seem to have been Gaza, whose original name was "Minoah," a clear reference to the fallen Minoic kingdom. The Philistines were organized in city-states… the most important the Gaza, Ashdod, Ashkelon, Gath and Ekron. Their territory was close to the Mediterranean coast, a little longer and broader than the present day "Gaza Strip." But, not the whole Judah, they never reached Hebron, Jerusalem or Jericho! Those dwelling in Canaan were defeated by King David and reduced to insignificance. The remaining Philistines still dwelling in Gaza were subdued by Sargon II of Assyria and after that time, they disappeared definitively from history. They are no longer mentioned since; the return of the Jewish exiles from Babylon. If Palestinians insist that they are descendents from the Philistines then they have to acknowledge themselves as invaders in Israel, and must return to Crete! The Philistines are extinct and claims to alleged links with them are utterly false as they are historically impossible to establish. In any case, claiming a Philistine heritage is idle because it cannot legitimate any land in which they were foreign occupants and not native dwellers. The Philistines were not Arabs, and the only thing in common between both peoples is… that in Israel they should be regarded as invaders, Philistines from the sea and Arabs from the wilderness. Palestinians don’t want Jerusalem because it is their city… it never was theirs! 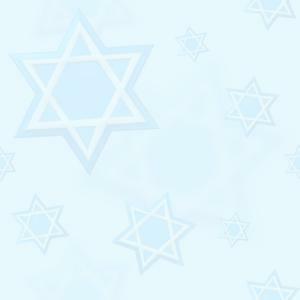 They simply want to take her from the Jewish people, to whom she has belonged for three thousand years. The Philistines wanted to take from the Israelites the Holy Ark of the Covenant (1 Samuel 4:11)… and modern day so-called Palestinians want to take from the Jews; the Holy City Jerusalem of the Covenant.